If you’re currently looking for a hosting provider to house your next online project, then odds are you’re looking for a Windows hosting solution. After all, according to NetMarketShare.com which tracks the number of Windows and Mac users worldwide, 88% of global PC’s run on Windows as opposed to just 7.4% of Mac users. Keep in mind that when people refer to web hosting, they’re talking about shared web hosting. Shared web hosting simply means that multiple users websites reside on a single server. The server’s available resources are shared among customers housing their websites on that specific machine. Shared web hosting is suitable to people who plan on creating smaller online projects and do not need an excessive amount of RAM or storage space. So whether you’re starting a new blog or creating a new business from scratch, here’s our list of the 10 best Windows shared hosting providers. Qhoster was established in 2004 where its founders eventually managed to turn a single server into an internationally recognized hosting provider serving thousands of clients worldwide. They have servers located in 13 different locations, including several in the US, Mexico, Canada, Bulgaria, Italy, France, Germany, Netherlands, Russia, and more. Qhoster.com offers three different cPanel-based Windows shared hosting plans. The prices of which start at $6.44 a month for the Pro plan, $12.94 a month for the Biz plan, and $7.62 every three months for the Mini plan. The Mini plan is very affordable. At just $2.54 a month, you get access to 10 GB disk storage, unlimited bandwidth, unlimited emails, a free domain name as well as a free SSL certificate. The Pro plan comes with 150 GB of storage and allows for an unlimited number of domain names. The Biz plan gets 250 GB storage and a dedicated IP address. Although QHoster’s Mini plan has an attractive price tag, QHoster loses points for not stating the amount of RAM available for each plan and for not giving specific information regarding their shared hosting servers. With this, we have to assume they rent out HDD servers. SoftsysHosting was founded in 2006 where they became quickly known for their enterprise level setup, state of the art infrastructure, and knowledgeable technicians. Best of all, SoftsysHosting owns their own equipment, so you won’t find any cheap outsourcing here. Their shared hosting plans are hosted on lightning fast RAID SSD servers and comes with a Plesk 12.5 control panel. Their Personal Shared hosting plan costs $9.95 a month, or at an annual purchasing rate of $9.16 per month. It includes 2 GB of SSD storage, 20 GB of bandwidth a month, a free SSL certificate and CloudFare server shield. Only 2 domain names can be hosted on this plan but it allows up to 100 sub-domains and 2 separate MySQL 5 databases. With the Enterprise Shared plan you get access to 5 GB of SSD disk space, 50 GB of monthly bandwidth, and up to 5 domain names can be hosted. The Enterprise plan costs $14.95 monthly or $13.75 a month annually. While their prices and plan specifications may not be the best, we’re impressed by their secure datacenters, state of the art servers, and commitment to quality. Very reliable Windows shared hosting provider. InMotionHosting has been in the web hosting industry since 2012 and is composed of a team of technology experts who posses an average 10 years web hosting experience. InMotionHosting has won over 30 accolades and awards from a number of industry websites and vetted companies in just a few years. InMotionHosting offers three different shared hosting plans on their SSD servers: Launch, Power, and Pro. The plans cost $5.99, $7.99, and $13.99 a month respectively. Each plan comes with unlimited storage space, unlimited bandwidth, over 400 preinstalled applications, and $250 in free advertising credit. The Launch plan allows 2 websites to be installed, the Power plan allows up to 6, while the Pro package is unlimited. Overall, each plan comes with its own unique set of features at a reduced cost. We like the fact InMotionHosting allows unlimited storage space alongside a ton of freebies. Their prices are reasonable with their Power plan standing out as the real value buy. Try one of their shared Windows plans with a 90-day money back guarantee today. 3Essentials.com has been in business since 2001 and has served well over 30,000 global customers. This is a privately owned company with an A+ rating from the BBB. Their datacenters are located in Texas, USA and North Carolina, USA. 3Essentials offers three shared hosting plans which include Pro One for $5.99 a month, Pro Five at $9.99 a month, and Pro Ten for $13.99 a month. The Pro One plan allows 1 website installation and comes with 2 GB of SSD storage, 1 MySQL database of 500 MB, and unlimited emails. Their annual rate on this specific plan allows you to save 16% for a monthly cost of just $4.99. The Pro Five plan allows 5 websites to be installed, and comes with 10 GB of storage and 5 MySQL databases. The Pro Ten package allows 10 websites to be installed and includes 20 GB of disk storage and 10 MySQL databases. If you’re looking for affordable and reliable Windows hosting for a smaller project then go with 3Essentiall’s Pro One plan for $4.99 a month. Other than this, their larger packages are not that appealing. In addition to this, each hosting plan’s features and add-ons could be improved upon. Although VirMach.com hasn’t been in the web hosting industry for a long period of time, they’re quickly gaining traction with their affordable VPS solutions. Apart from offering Windows and Linux VPS, they also offer shared Windows hosting plans. VirMarch’s shared hosting plan comes with a number of unlimited features. Such as unlimited domains, unlimited FTP accounts and MySQL databases, unlimited emails and storage capacity, and unlimited bandwidth. The shared hosting plan also comes with 1024 MB of RAM, a free domain, and DDoS protection. Although emails are unlimited, there is a 250 email per hour limit. So what’s the cost? All of these features and more cost a mere $5 per month. You won’t find too many hosting providers who give such a large number of unlimited features at this price. VirMach is definitely a Window hosting provider to mark down for future reference. They rely on their own SSD machines and have low prices – don’t miss out. Arvixe.com is based in San Luis Obispo, CA, USA and was founded in 2003. Arvixe has received numerous awards from industry authorities such as HostReview and was even featured by Inc magazine for being one of the fastest growing hosting providers in the world. Arvixe has two shared Windows hosting plans, a regular and pro version. Their regular Windows hosting plan costs just $5.00 a month and comes with 1 website, unlimited SSD disk storage, unlimited transfers and bandwidth, unlimited subdomains and emails, and even an unlimited number of MySQL 5 databases. While the regular plan comes at a monthly cost of $5.00, the pro version costs $8.00 a month. The only main difference between the two hosting plans lies in the number of allowed websites. The regular plan allows just 1 while the pro version allows up to 5 websites. Unless you plan on building multiple websites, you’d be wise to choose Arvixe’s regular shared hosting plan for just $5. Low prices, SSD storage, and a commitment to protecting your privacy are the factors that led us to placing Arvixe at the number 5 spot. HostGator is undoubtedly the largest hosting company on this list. Since 2002 HostGator has provided their global client base with shared, WordPress, cloud, and VPS hosting services at ultra cheap prices. HostGator has received an endless number of awards, such as “Best Host to Grow With” in 2016 by Hosting Advice and “Best Web Hosting for Business” by WpBeginner. For Windows shared hosting, HostGator has three plans available: Hatchling, Baby, and Business. As an introductory offer the Hatchling plan costs only $3.95. The Baby plan costs $9.56 a month while the Business plan costs $13.56 per month. Disk space and bandwidth for each plan is unlimited, although the Hatchling plan only allows 1 website while the others allow a limitless number. Sub-domains, FTP accounts, and MySQL databases are also unlimited across the board. The Business plan is the only package that comes with a dedicated IP address and free SSL certificate. Apart from this, HostGator also gives new customers $100 in free Google Adwords and Bing advertising credit. When practically everything is unlimited there’s not much that can go wrong. HostGator is a well-known company offering shared Windows hosting plans with a variety of features, a great company to start an online journey with. Contabo is based in Munich, Germany and was recently ranked as the sixth fastest growing technology company in Germany at the Deloitte Technology Fast 50 awards. Contabo offers four different Windows web hosting packages. The prices for each plan are $3.20, $5.30, $8.60, and $10.75 per month. Their cheapest plan allows for 1 website installation and comes with 50 GB of storage, 20 MySQL databases, and allows up to 1,000 email addresses. Their larger hosting plans come equipped with 100 GB, 250 GB, and 500 GB of disk storage. To install more than a single website you would need to purchase Contabo’s $8.60 or $10.75 plan, which allows up to 2 and 3 website installations respectively. Overall Contabo comes with plenty of features and add-ons. Their smallest Windows shared hosting plan is very cost-effective, but if you need a more powerful hosting solution then it may be better to look elsewhere rather than go with one of their larger packages, which are a bit lacking in power and capability. But overall, great option for Europeans on a budget. AccuWebHosting has been in the web hosting business since 2002 and is based in Colorado, USA. They have access to four state of the art datacenters around the world, including in the US, India, Singapore, and Amsterdam. AccuWebHosting offers both cloud and SSD hosting for Windows users. Their SSD servers utilize the the Windows 2012 OS and the latest ASP.Net tools. They offer three hosting packages: Personal, Small Business, and Enterprise. The Personal plan costs just $3.19 a month and includes 10 GB storage, 100 GB of monthly data transfer, and 10 MySQL databases. Their Small Business hosting plan appears to be the better value pick, and comes with 30 GB of storage, 200 GB of monthly data transfer, 30 MySQL databases, and allows up to 3 websites. The Enterprise plan costs $11.17 a month and includes 50 GB of storage space, 300 GB of monthly data transfer, and allows up to 5 websites. Our only problem with AccuWebHosting’s shared hosting plans is the fact each plan has a 150 email limit per account. So this isn’t exactly the best hosting provider for email marketers or medium size business owners – but their super low prices more than make up it. HostWinds was established in 2010, but in that brief period of time has managed to accumulate a large percentage of the web hosting industry’s market share, thanks in large part to their simplicity and cost-effective solutions. HostWinds utilizes servers from two US-based datacenters. Each of their Windows hosting plans includes unlimited disk storage, unlimited bandwidth, and nightly server backups. HostWinds Basic plan is good for single website users, which comes with 1 free dedicated IP address for just $4.50 a month. Their Advanced plan can house up to 4 websites while the Ultimate plan can house an unlimited number of websites, all at a cost of $5.50 and $6.50 per month respectively. Our only concern with the HostWinds shared hosting plans is that they run on standard HDD servers. In order to get the faster speeds that come with SSD servers you would need to purchase one of their Business hosting plans. Business plans cost $5.00, $7.50, and $10.00 monthly. 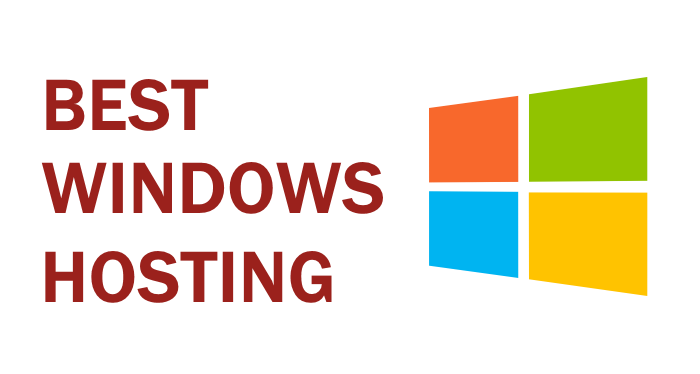 But other than this, HostWinds is an excellent Windows hosting provider with some of the lowest monthly costs in the industry. Highly recommended.